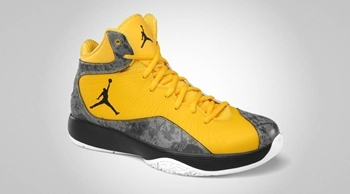 Jordan Brand enjoyed tremendous success with their banner model for this year, the Air Jordan 2011. This month, another variation of that model is set to come out and it is expected to gain a lot of attention. The Air Jordan 2011 A Flight will be released in Varsity Maize/Anthracite – White colourway, which features a Flywire-embedded synthetic upper paired with marble-printed leather overlays along with black midsole and white outsole that looks so good together. Looking for new pair of shoes this Holiday Season? This one should definitely be considered! Air Jordan 2011 Q Flight “Year of the Rabbit” Edition Released! Four New Air Jordan 2011 A Flight Lined-Up This November! Another Jordan Melo M8 Released! First Jordan Flight 45 High for 2011 Already Out in the Market! Comet Red Air Jordan 2011 Making an Impact!